About Us At Adrenaline - Discover Our Passion For Adventure! Adrenaline is the name of the game when taking part in experiential adventures that push personal limits and highlight natural wonders in a fresh and unforgettable way. There is one online gift retailer that is so passionate about this pursuit of pure sightseeing and thrill-seeking excellence that it bears the title of the exhilarating sensation of living life to the full. The place to book your unparalleled experiences on land, air, on or in the water with Australia’s most trusted and professional providers is, of course, Adrenaline. Adrenaline is also Australia’s longest-running and most recognised adventure site. Adrenaline has been turning Australia’s adventure dreams into reality for more than 20 years. Fun-filled thrills are Adrenaline’s main aim. You can book all experiences online or order gift cards and vouchers for the recipient to redeem. What makes Adrenaline stand out from other adventure sites? Ranking as Australia’s number one adventure site with a price guarantee for experiential and financial value puts Adrenaline head and shoulders above the competition. This winning form is based on pure passion and dedication to the fine art of offering Australia’s best adventures. Adrenaline takes great pride in injecting free-spirited fun, fresh, challenging and exciting experiences, and ensuring your safety and memory-making capabilities come first and foremost. 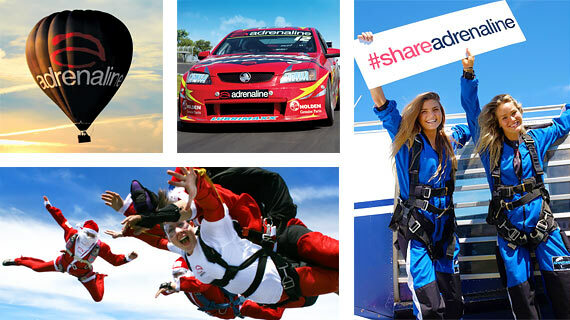 For this reason, Adrenaline only enlists the services of the cream of Australia’s high-flying, motor-running, bridge-climbing, horse-riding, jet-boat, jet pack, jet ski, tall ship and white-water rafting, dolphin and shark-swimming, whale-watching and an endless host of experiential providers. There is also the option of the more laidback and luxurious pursuit of massage therapy, gourmet food experiences, winery tours, super-pass entry to theme parks and other major attractions. These are just the tip of the iceberg of the limitless experiences you can book online at Adrenaline. Each and every one is conducted by leading operators, practitioners and professional instructors at championship levels. What kinds of adventure does Adrenaline offer? ‘What kinds of adventures doesn’t Adrenaline offer’ is the more pertinent question!? In a nutshell, the category selection is divided into: driving experiences; land adventures; flying experiences; water sports; gourmet and wellbeing experiences. There’s an endless list of choices within each category, from V8 Experiences, Sydney Bridge Climbs, Indoor and Tandem Skydiving, Jet pack and Fly Board to BBQ Classes. 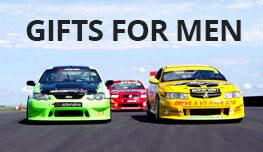 You can also purchase a range of hampers, gift baskets and vouchers online at Adrenaline. How do I choose the right gift for the right person? 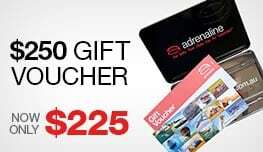 Simply jump online and peruse the many and varied gift idea categories at Adrenaline. You can type in the activity and location you have in mind as a search option and, hey presto, before you know it, you will be inundated with a selection of suitably thrilling experiences and localities for the gift recipient, all at affordable prices. An online chat function at Adrenaline also makes connecting with expert staff instantaneous. This process will effortlessly assist your gift-purchasing journey in the most helpful, approachable and professional manner. There is a handy FAQ (or frequently asked questions) page, where you can access all the help required for not only receiving the fine detail, but also choosing that perfect gift idea for the thrill-seeking recipient. What are the five best adventures at Adrenaline? Tandem Skydiving up to 14,000 feet over Airlie Beach. V8 Drive and Hot Laps (Front Seat), 9 Lap Combo, Eastern Creek, Sydney. Sailing, Tall Ship Twilight Dinner Cruise, Sydney. Swim with Dolphins and Seals, Mornington Peninsula. Hot Air Ballooning over the Hunter Valley with Breakfast and Photo Package.